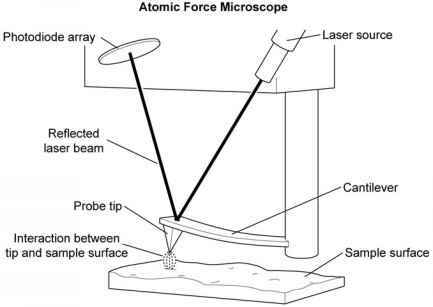 The atomic force microscope is sometimes called a Scanning Force Microscope. The AFM measures the interaction forces between probe tip and sample. The Scanning Tunneling Microscope (STM) is very sensitive to vibrations. Just someone sneezing in the same room, can jam the microscope's tip into the sample and damage the experiment. How Does the AFM Work? AFM is part of a family of instruments called scanning probe microscopes (SPM). AFM uses a probe moving across the sample's surface to identify its features. The probe is a sharp tip, usually made of silicon, at the end of a cantilever that bends in response to the force between the tip and the sample being viewed. Any deflection from the sample is measured and the AFM records the surface topography. The topography is the projections (lumps), depressions (pits), and textures of a surface. The tip never touches the sample surface because it could damage it. AFMs are widely used to measure surface topography of many types of samples. Note: AFM can image objects that are solid and have a surface. atoms on the surface of the material and those on the tip cause the tip to deflect. This deflection can be recorded in various ways, the most common of which uses a laser focused on the top of the cantilever and reflected onto photodetectors. A laser is a special type of amplified light beam and is an essential part of CD and DVD players and recorders. The photodetector signals are used to map the surface topography of samples with resolutions down to the nanoscale. At the nanoscale, the microscope is able to determine roughness, grain size, and features. The number of applications for AFM has increased dramatically since the technology was invented in 1986. Presently, the AFM microscopes are used for a variety of applications in industrial and scientific research that includes such areas as microelectronics, telecommunications, biological, chemical, automotive, aerospace, and energy industries. Researchers also employ the AFM as a tool to investigate a wide range of materials such as thin and thick film coatings, ceramics, composites, glasses, synthetic and biological membranes, metals, polymers, and semiconductors. The continuing application of the AFM systems will lead to advancements in such areas as drug discovery, life science, electrochemistry, polymer science, biophysics, and nano biotechnology. An angstrom is very small. An angstrom is a unit of length equal to one-hundredth millionth of a centimeter or 10-8. Remember, a nanometer is 10-9. Chemists and physicists measure the distances in molecules or wavelengths of light in angstroms. The difference between AFM and other microscopy techniques is the quality and the measure of resolution. While electron and optical microscopes provide a standard two-dimensional horizontal view of a sample's surface, AFM also provides a vertical view. The resulting images show the topography of a sample's surface. While electron microscopes work in a vacuum, most AFM modes work in dry or liquid environments. AFM does not require any special sample preparation that could damage the sample or prevent its reuse. AFM also can be used for imaging any conducting or nonconducting surface properties of a substance, while the STM is limited to imaging only conducting surfaces of a sample. The AFM is a major part of the $1 billion nanotechnology measurement tools market that is expected to continue to grow at about 20 percent a year. 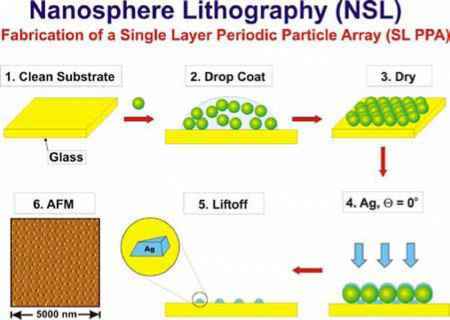 AFM tips are generally made of silicon or silicon nitride. For most applications, pyramid-shaped silicon nitride tips are used. They are relatively durable and present a dry surface to the sample. Conical silicon tips are often used for biomolecular applications because they are very sharp and present a wet surface. However, they are relatively less durable. Conventional silicon tips are good for measuring relatively flat surfaces, but they do not penetrate the crevices that often exist in small devices and structures. The silicon tips also wear out quickly, reducing image resolution. The magnetic force microscope (MFM) is another scanning probe microscope. This microscope has a magnetic tip that is used to probe the magnetic field above the surface of a sample. The magnetic tip, mounted on a small cantilever, measures the magnetic interaction between a sample and a tip. The MFM was developed as an evaluation tool for measuring the magnetism levels in products. Mr. Nathan A. Unterman is a physics teacher at the Glenbrook North High School in Northbrook, Illinois. He teaches physics to high school juniors and seniors. He and his students have built and used LEGO® models of the atomic force microscope (AFM) and the magnetic force microscope (MFM). 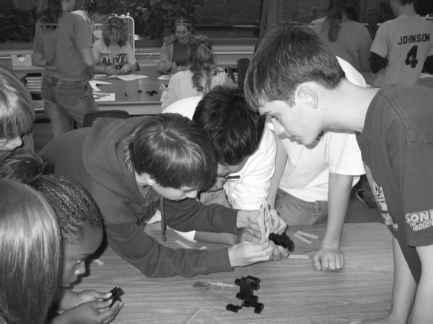 The author asked Mr. Unterman about how his interests in nanotechnology and his work in building LEGO®® models.